The Pebble Smartwatch concept, which integrates with your iPhone and Android smartphone, has announced the entire 85,000 initial pre-orders have now sold out after reaching an astonishing $10,000,000 (£6.2m) in funding from Kickstarter backers. The Bluetooth 4.0 wrist-watch, which will run apps with the help of your smartphone, had attained 66,550 backers, at the time of writing and has reached made the decision to close the donation process after obliterating the $100,000 goal it was attempting to reach in 40 days. Instead it reached $10m in 32 days. Pebble which features an e-paper display that's highly visible in sunlight, utilises your iPhone or Android's GPS signal to run fitness apps, control the music on your smartphone and receive delivery of urgent messages and was heralded this week as the most popular project in the history of the crowd-sourcing site. New apps can be downloaded from the Watch App Store on your smarthpone and will be automatically transferred to the watch. An update on the Kickstarter page says: "We've thought a lot about this decision, and we feel it's time. You, our backers, were the first group of people to believe in Pebble, and we want to return our focus to creating the most awesome watch possible for you." 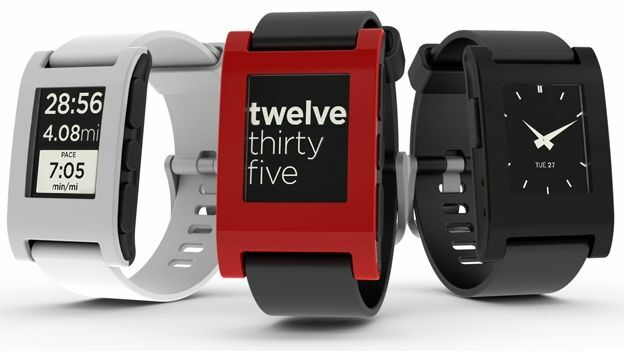 The watch will eventually go on sale again at getpebble.com.